Whenever I miss the gelato in Italy, I’m so thankful that I can go to Coletta Gelato here in San Francisco. It’s some of the best gelato I’ve had outside of Italy and for good reason. 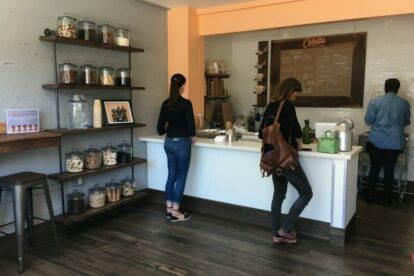 Before my first visit, I learned that the owners of Coletta Gelato studied at a real gelato university in Bologna so I knew right away their gelato would be fantastic. They only use local ingredients and make their gelato fresh every day so that you are getting the highest quality treat. They change their menu frequently to keep things interesting or to create flavors based on what’s in season but my favorite flavors so far are cookie coconut, gianduia (chocolate with hazelnut) and pistachio. They also make seasonal sorbets like pear, mango, and strawberry. I also love the shop itself because it’s cool and quiet and the perfect place to take a break from the bustling and noisy city outside and indulge in one of my favorite desserts. If you can’t make it to this location don’t despair because they also have shop in the Mission District as well!